Ok guys, I told you all about how much I was obsessed with veggie trays. But I’ll be honest, when I completed my Halloween veggie tray with cheese graveyard and Frankenstein guacamole, I was exhausted! The problem was I knew I had another holiday to prepare for and outdo very soon! Instead of another veggie tray, I thought I might tackle the charcuterie tray. If you would have said charcuterie to me about 3 years ago, I would have stared at you like you were talking in some foreign language. Turns out charcuterie is essentially just a fancy word for “meat and cheese”. Jess and I are big fans. We’ll take some charcuterie to a concert or order one at a local restaurant with some wine on a night out, or even make one as dinner. I mean, who doesn’t love meat and cheese! 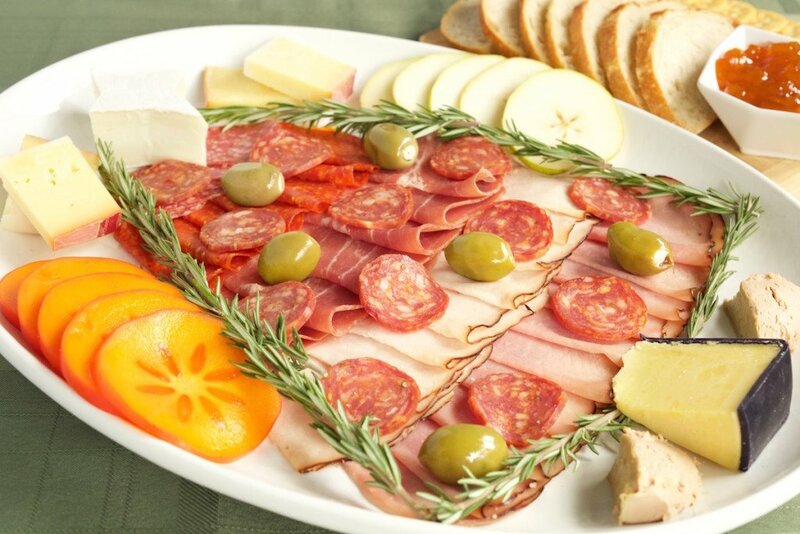 What I love about this Christmas charcuterie tray is it’s very much festive and fun to build. You can add and change whatever you want, and that’s the beauty of it, you can be creative and add your own little spin on things. I made a mistake when shooting the photographs and forgot to add the nuts I. My attention to detail did waiver, but I promise it won’t happen again. ayer meats in rows, one on top of the other, except for the uncured Abruzzese (The slices of meats are folded in half and each row has a little less the row before to become the shape of a tree). Once the tree is built, add the Abruzzese as “ornaments” as well as the stuffed olives. Outline tree with Rosemary sprigs. Cut the brie into the shape of a star (mine turned into a 4 point star) and put at the top of the tree. Cut the whiskey cheddar into the shape of a tree trunk and place at the bottom of the tree. Add fruits, extra cheese, Fois Gras mousse, and nuts around the tree. On a separate plate/cutting board (if you don’t have enough room on the platter with the tree), place bread, crackers, and apricot preserve. Present and astound everyone with your creativity!!! Ho Ho Ho!